5 Fit Meals Anyone Can Make! Tired of dietary approaches that have more instructions and steps than your 1040? Try this less taxing menu. Dieting shouldn't be overwhelming, but too often it is. This is eating we're talking about. People have been doing it since they were engraving glyphs into cave walls. It should come as naturally and instinctively as breathing and procreating. So I'm here to bring simplicity back when it comes to eating healthfully. A diet plan need not be complicated. Following proper fat-loss protocols can be simple and convenient, not to mention great tasting. A high dose of protein to keep you feeling satisfied and safeguarded against muscle loss. A moderate dose of carbohydrates to supply slow-burning energy. Healthy fats to round-out a meal plan to keep hunger levels under control. So let's get started, shall we? Your new body awaits! In theory, skipping a morning meal to save calories may seem like a good idea. Don't kid yourself. If you don't eat in the morning, your hunger will strike with a vengeance later in the day, making it far more difficult to stick with your meal plan. 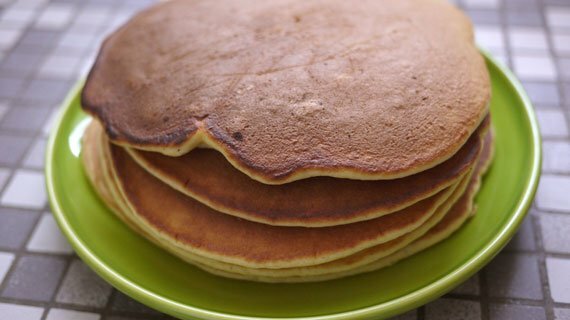 Nothing is as simple as starting the day with homemade protein pancakes. They'll satisfy just about everyone's taste preferences and have major health benefits. If you typically turn to the coffee maker to power through your morning, consider having a healthy snack instead. This will help fuel the body so you're not as ravenous at lunch. Stir the walnuts into the vanilla yogurt. Serve as a fruit dip for the banana. This is an extremely simple snack, but will still give you protein, carbs, fiber and healthy essential fatty acids. Lunches tend to be overfilled with carbohydrates, which just make you want to take a nap an hour later. Instead, opt for a protein-based meal. Focus will be your friend later in the afternoon. Spinach already comes in individual leaves, so you don't have to worry about ripping it apart in the morning when you're pressed for time. Grill some chicken over the weekend and freeze it to increase the simplicity of preparing a lunchtime salad. Add chicken to the spinach before going to work. In a separate container, mix the low-fat Caesar salad dressing with olive oil. This is a much better option than plain Caesar salad dressing, which is typically high in saturated fat. This option provides healthier fat, but still gives you a Hail-Caesar taste! Come mid-afternoon, does your stomach start rumbling? Do you begin searching for a snack? Rather than walking into the break room to scarf a leftover donut, try this quick fix instead. The night before you plan to have a snack, heat olive oil in a pan over medium-to-high heat and tear up a soft tortilla into smaller bite-sized pieces. Place them in the oil and let them sit for a couple of minutes. Remove them from the oil and place on a napkin to allow the oil to drain. Sprinkle a small amount of sea salt for flavor. Mix the salsa and tuna together and place in a container for the next day. Serve the tortilla chips with the tuna and salsa dip at work. This is a far better option than regular potato chips. The shell provides a healthy dose of fiber; the tuna adds muscle-building protein. Continue fat-loss nutrition by eating wisely at dinner. Be mindful of your carbohydrate intake when the day winds down because you won't burn as much energy. Brush olive oil on tilapia fish and place in a casserole dish. Top with slices of lemon and other spices you desire. Place in a pre-heated oven at 350 degrees about 45 minutes or until fish flakes. Ten minutes before the fish comes out of the oven, place the chicken broth in a saucepan over medium to high heat. Add in broccoli, carrots, zucchini and cook until desired tenderness. Sprinkle any additional spices you enjoy and serve with fish right out of the oven. The chicken broth adds a nice hint of flavor to the vegetables. No butter is necessary during the cooking process. If you're short on ideas, use these five simple meals to help guide you. Find easy ways to boost flavor by adding chicken broth, herbs, spices, cinnamon, protein powder or fruits and vegetables. Create diet meals that are quick to make and taste great. Have a plan. It makes it easier to remove the guess work. If you know what to prepare the night before, you spend only 10 minutes preparing breakfast and lunch. Your morning won't feel rushed. Ever catch yourself struggling to pronounce ingredients on food labels? Learn which ones should never make it to the checkout line. Stop blindly following someone else's nutrition protocol with middling results. Start making a nutrition strategy that works specifically for you!